See It Now | K. A. S. Art Gossip! Lexington Visual Collective mission is to provide a home, not just for the individual artist but for every artist in Lexington through an open environment in which to meet, collaborate, work and play.It is to provide consolidated resources and opportunities focused especially on emerging artists, to help them better integrate into the Lexington arts community and its supporting institutions.We aim to compliment the services of our local non-profit organizations, as well as the collegiate training of visual artists who are ready to advance their careers in and outside of Lexington. Botanical art creates an awareness of plant life in various forms. Plants are a living art form and many talented artists acknowledge the power of plant life and it’s beauty. However, botanical artists have the ability through their work to capture in an image or painting what most can not see by viewing a plants outer appearance. The botanical art tradition combines science and art. Botanical artists seek to understand the structure of plants and to communicate this knowledge to their audience in an aesthetically pleasing manner. K. A. S. Gallery is exhibiting a variety of national and international botanical artists at Mellwood Art Center, from May 13Th to June 24Th. An art reception will be held on May 27Th, 6:30 -9 p.m. The public has a right to art. Art is for everybody. I’ve been anticipating this for months! Keith Haring ranks among the most iconic, influential and popular artists in the world. Nearly twenty years after his death, this historic exhibition of rarely exhibited early work examines the prolific years that established Haring’s language as an artist, his politics and social conscience. Kentucky Art Speaks/K.A.S. 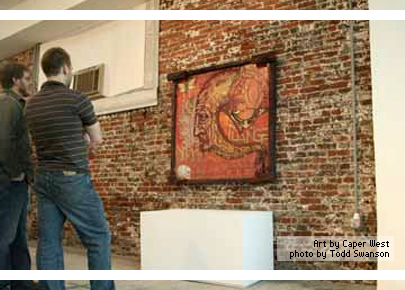 Gallery at Mellwood Art Center is currently featuring a mixed media collaboration. 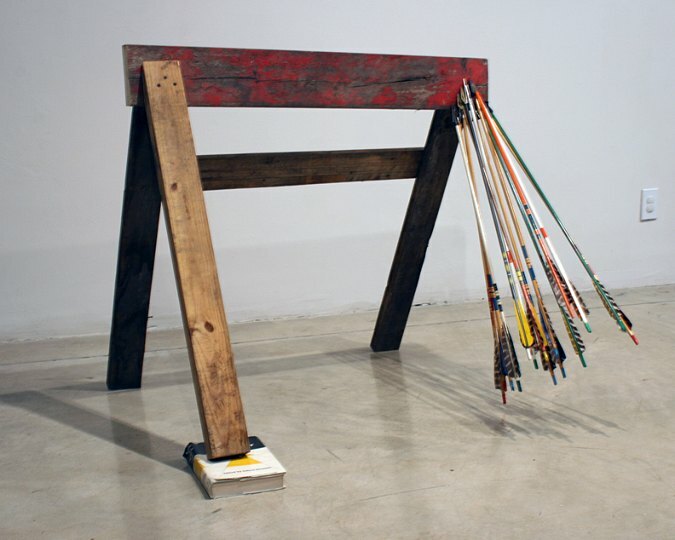 This exhibit expresses the imaginative and analytical minds of 15 regional artists. These artist devour the emotions of today’s society and exploit them through the creativity of their work. The artists have the ability to break down the barrier between the viewers and the real world with close detail, suppressed and flamboyant emotion and a clear alertness of color. See it now! 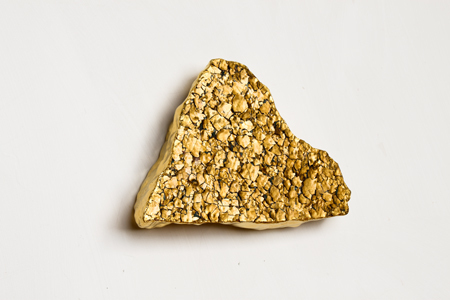 For this installation, Turner-Yamamoto uses elements such as plaster and paint chips to create sculptural works and a series of paintings which together are meant to comment on fragility and transience in the human world. The painting series (see above image), Pentimenti, utilizes a gilding technique inspired by medieval icons. Disappearances is part of a larger regional project. 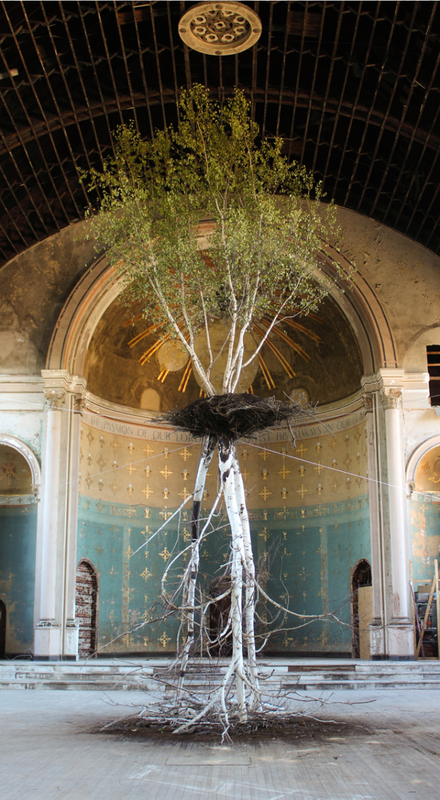 Concurrent to this show, Turner-Yamamoto’s installation Hanging Garden was on view at Holy Cross Church—the abandoned chapel located in the Monastery in Mount Adams. Hanging Garden is a sculpture consisting of two trees—a live tree perched atop a dead one—with roots intertwined. While surveying the grounds of the chapel, Turner-Yamamoto found the pieces of plaster and paint chips used in Disappearances. The installation was taken down on October 17th, but there is a picture of it below. Both Disappearances and Hanging Garden are a part of Turner-Yamamoto’s Global Tree Project, an international art initiative that seeks to open and affirm connections between audiences and the natural world. Shinji Turner-Yamamoto was born in 1965 in Osaka, Japan and studied fresco painting in Kyoto. He has exhibited around the world, from India to Ireland, and is committed to using historic and natural elements in his work as meditations on the environment. Hanging Garden: Holy Cross Church at the Monastery in Mt. Adams, 2010. 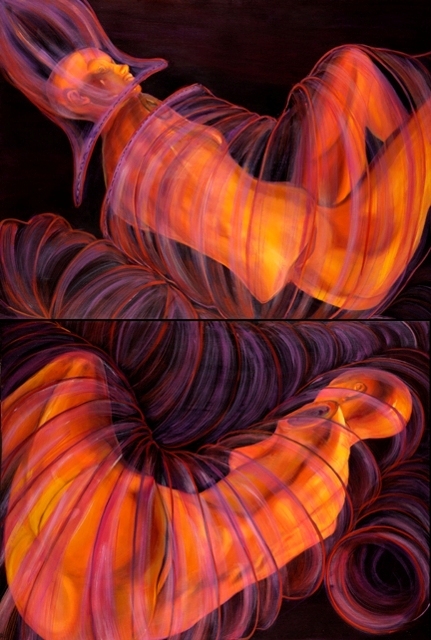 Debra Lott is a figurative oil painter and art educator. From January 2nd to February 2nd, she will be exhibiting her work at the Gallery. Come by and check it out! View more of Debra’s work and read her bio here. The second in a series, KY.7 Biennial is a regional survey of contemporary art produced in the Commonwealth of Kentucky and its seven contiguous states: Illinois, Indiana, Missouri, Ohio, Tennessee, Virginia, and West Virginia. Artwork selected is innovative in concept and execution, is culturally relevant, and addresses issues important to contemporary life. Juried by John Begley (Gallery Director and Coordinator of Critical and Curatorial Studies at the Hite Art Institute), Jason Franz (Executive Director and Chief Curator at Manifest Creative Research Gallery and Drawing Center) and Becky Alley (LAL Exhibitions and Programs Director). 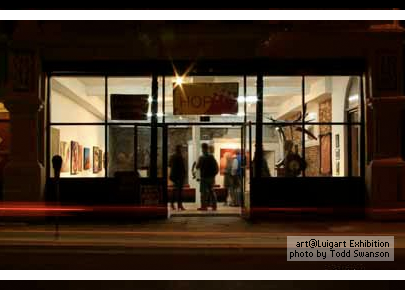 PYRO Gallery welcomes its four newest members, Christopher Mozier, Laura Eklund, Sarah LaBarge, and Suzanne E. Dougherty, to the gallery with the show “New Members, New Works” showing Thursday, September 9th through Sunday, October 17th with an opening reception on Friday, Setember 10th, 6-9 P.M. The show is representative of the four artists who are all at different stages in their artistic careers and whose work spans different mediums, source material, and artistic ideology. These differences become inherent in the way each artist explains their previous and current work. For more information on the individual artists, click here.